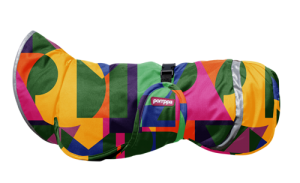 KevytPomppa is a mid-season coat that keeps your dog warm and dry in damp and cold weather. KevytPomppa’s design and sizing, as well as its waterproof and durable outer fabric, are the same as PerusPomppa’s. The inner lining is made of thin synthetic fur, which is soft and anti-static. KevytPomppa fits in a small space and provides good protection when the weather turns sour mid-hike. KevytPomppa provides comfortable protection for your dog in all kinds of weather. It keeps your dog dry even in pouring rain. The model of KevytPomppa is the same as PerusPomppa. Due to the thinner inner fabric, Kevyt fits slightly looser than PerusPomppa. KevytPomppa’s lining is made of anti-static knitted fabric with a soft finishing. All Pomppa coats use the waterproof outer fabric. Its colours vary according to season. 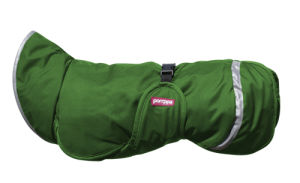 The compact coat is lightweight and easy to carry along even during long hikes. The durable coat is easy to wash and dries quickly.